Is the Nova Scotia Duck Tolling Retriever right for you? Find your perfect match now! This smallest retriever is like a reverse-mermaid. 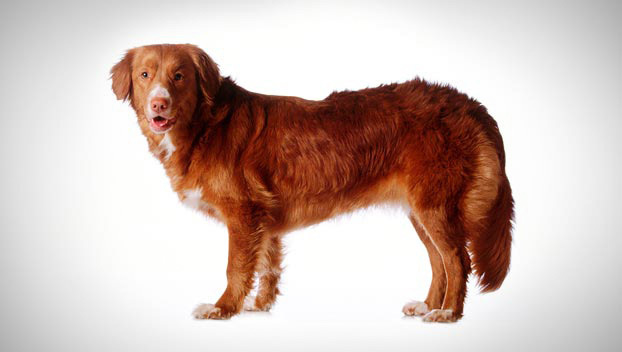 The “tolling” in the Nova Scotia Duck Tolling Retriever's name refers to this breed's distinctive wiggle-routine. They dance on land to catch ducks' interest and lure them out of the water. Apparently ducks find a dancing dog very alluring... nature is weird. Nova Scotia Duck Tolling Retrievers also have zero chill. They shriek like schoolgirls when they see birds. Border Collies beat them out in terms of sheer intensity, but not by much. Needless to say, this is a very unusual breed. Originally from Nova Scotia, this medium-sized and high-energy breed can grow to between 35-50 pounds and lives an average of 12-14 years. The breed is recognized by the American Kennel Club and classified as a member of the Sporting group. WHAT IS A NOVA SCOTIA DUCK TOLLING RETRIEVER'S PERSONALITY LIKE? These dogs are friendly, good-natured people-pleasers who are happy to see just about everyone on two legs or four. They are remarkably patient with kids but should still always be supervised. Nova Scotia Duck Tolling Retrievers are affectionate, confident dogs. WHAT IS NOVA SCOTIA DUCK TOLLING RETRIEVER BEHAVIOR LIKE? “Very active” is an epic understatement. 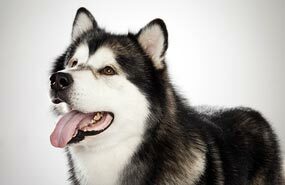 This compact breed has a powerful, agile build and would run all day if you let him. Nova Scotia Duck Tolling Retrievers are hard-working, driven, and alert. HOW EASY IS IT TO TRAIN A NOVA SCOTIA DUCK TOLLING RETRIEVER? Like many sporting breeds, the Toller is very responsive to training. But they're also smart dogs, so it's important to keep their minds as active as their restless bodies. Be patient and consistent while training your furry friend, but keep it fun too. These pups respond well to treats, praise, and play rewards. Nova Scotia Duck Tolling Retrievers often excel at flying disc, flyball, and agility dog sports. Participating in these events is a great way to channel this breed's seemingly boundless energy. HOW MUCH DO NOVA SCOTIA DUCK TOLLING RETRIEVERS SHED AND WHAT ARE THEIR GROOMING NEEDS? Nova Scotia Duck Tolling Retrievers are seasonal shedders who don't require much grooming. The occasional bath and weekly brushing should do it. WHAT HEALTH PROBLEMS DO NOVA SCOTIA DUCK TOLLING RETRIEVERS HAVE? This is breed is generally healthy. Some are susceptible to eye disease and hip dysplasia. ARE NOVA SCOTIA DUCK TOLLING RETRIEVERS GOOD FOR PEOPLE WITH ALLERGIES? The American Kennel Club doesn't list Nova Scotia Duck Tolling Retrievers among its breeds recommended for allergy sufferers. You can reduce your furry friend's impact on your allergies with frequent baths and brushings to reduce loose hairs and allergy-aggravating proteins in your pet's dander. Use a damp cloth to wipe off your dog after playing outside. Smaller dogs have less surface area, so they produce comparatively less dander than larger breeds — definitely something to keep in mind with a dog like a Nova Scotia Duck Tolling Retriever! Remember that no breed is 100% hypoallergenic, and any breed can aggravate allergies. WHAT IS A NOVA SCOTIA DUCK TOLLING RETRIEVER'S BEST DAY? Step 1: Grab a toy, preferably near a body of water. Step 2: Throw the toy. Step 3: Wait for your Nova Scotia Duck Tolling Retriever to bring the toy back. Step 4: Start over at Step 1 again. And again. And again. And again. And again. And again. And again. Eventually it'll get dark out, which will make it harder for your canine perpetual motion machine to find the toy. Then it's probably time to stop playing and go have dinner. Definitely not before. SHOULD I ADOPT A NOVA SCOTIA DUCK TOLLING RETRIEVER? This is not a dog for sedentary folks. A Nova Scotia Duck Tolling Retriever matches best with a very active person or family with a home in a cold weather climate — especially if that home is close to an ocean or lake this webbed-footed pup can swim in. Have you decided that a Nova Scotia Duck Tolling Retriever is the perfect dog for you? Why not be your new best friend's hero and adopt a rescue! Be sure to check out our article on what to expect when you're adopting a dog or cat.